Like Mark Twain, Kurt Vonnegut (1922-2007) was a Midwestern everyman steeped in the rhythms of American speech whose anger at the way things are was matched only by his love for the best that we can be. His cunningly relaxed delivery was so original, so finely calibrated, and so profound an articulation of the Sixties' spirit that many critics overlooked the moral seriousness behind the standup-comic craftsmanship. 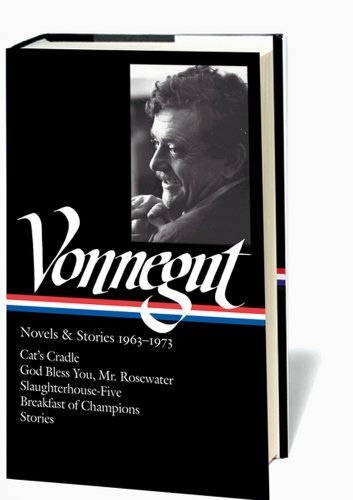 Capturing Vonnegut in pyrotechnic mid-career, this first volume of a projected three-volume edition gathers four of his most acclaimed novels. Cat's Cradle (1963) is a comedy of the end of the world (it ends with ice). God Bless You, Mr. Rosewater (1965) is the tale of a so-called fool, his money, and the lawyer who contrives to part them (it ends with fire). Slaughterhouse-Five (1969), Vonnegut's breakout book and one of the iconic masterpieces of twentieth-century American literature, is the tale of Billy Pilgrim, who, being unstuck in time, is doomed to continually relive both the firebombing of Dresden and his abduction by space aliens. And, in a text enhanced by the author's spirited line drawings, Breakfast of Champions (1973) describes the fateful meeting of "two lonesome, skinny, fairly old white men," one of whom disastrously believes that everyone else is a robot. The volume is rounded out with three brilliant short stories and revealing autobiographical accounts of the bombing of Dresden.